Salt Lake City 2019 2700 S Reconstruction Map (from the Salt Lake City project webpage). 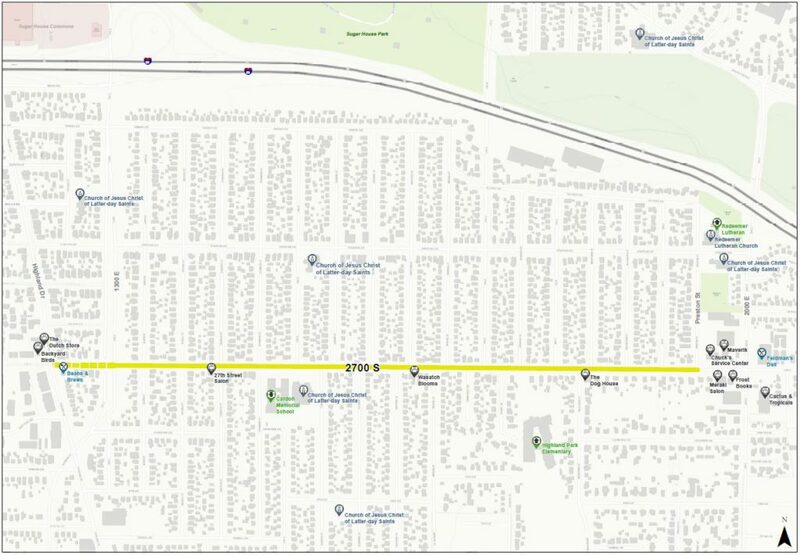 Here, we write support of the installation of bike lanes, raised crosswalks, lower speed limits, and other traffic calming measures on 2700 South from Highland Drive to Preston Street. Salt Lake City’s future must include safe, livable, sustainable, people first streets. 2700 S is a great opportunity to implement this philosophy and make SLC a better place to live and travel. 2700 S has needed bike lanes since at least 2007 when the MBAC made a favorable recommendation for bike lanes between 1700 E and 2300 E. Sadly, bike lanes were not implemented back then, and the roadway remains suboptimal for safe cycling and walking. This demonstrates the long term need and desire for a better 2700 S.
Bike lanes help to slow traffic speeds, which are far too high in Salt Lake City. This creates dangerous conditions for pedestrians and cyclists, who are at risk for far more serious injuries with higher motor vehicle speeds. While the project ends at approximately 2000 E, bike lanes should be added as far east as 2300 E. There appears to be room to stripe with minimal reconfiguration. This would help to create a broader network faster. Strava data shows that this is a high use corridor for cyclists, and as such, bike lanes on both sides of the roadway are imperative. This of course would be the case even if data did not show high use as 2700 is an important connector, and all connector streets in SLC should have bike lanes. Just as cars use the roadway to reach destinations, so do bicyclists. In regards to the raised crosswalks, please install those in all of the original planned locations. Salt Lake City’s baffling moratorium on speed bumps means that we have fewer tools at our disposal to slow traffic through good roadway design. A recent email by the 2700 S. Project Team indicates that SLC is reducing the number of raised crosswalks from seven to three. Why? Because a few people want to drive faster and endanger more people on foot, people on bikes, and people in cars? This is an anti-safety decision. According to the Pedestrian and Bicycle Master Plan of 2015, 2700 S is supposed to get bike lanes from 700 E to 2300 E at least. Since this is a street reconstruction, the Salt Lake City Complete Streets Ordinance states that this must become a complete street – which in this case means bike lanes on both sides, and safer conditions for bicyclists and pedestrians. In conclusion, we are fully supportive of Salt Lake City’s original plan of bike lanes and seven raised crosswalks on 2700 S. We also support a lowering of the speed limit to 25 mph. Studies show that lowering the speed limit does in turn result in lower traffic speeds, and thus any reference to the bogus 85 percentile guideline should be discarded. Salt Lake City's plans will result in a Complete Street. We fully support this. We do encourage the City to extend this project to include Highland to 1300 E and 2000 E. to 2300 E.
One Response to "Editorial: Salt Lake City’s 2700 S Reconstruction Should Include Bike Lanes"
I ride my bike a lot and having another safe street for me is important. Please go forward with the complete streets ordinance and put bike lanes in both directions. I want better biking in Salt Lake City.